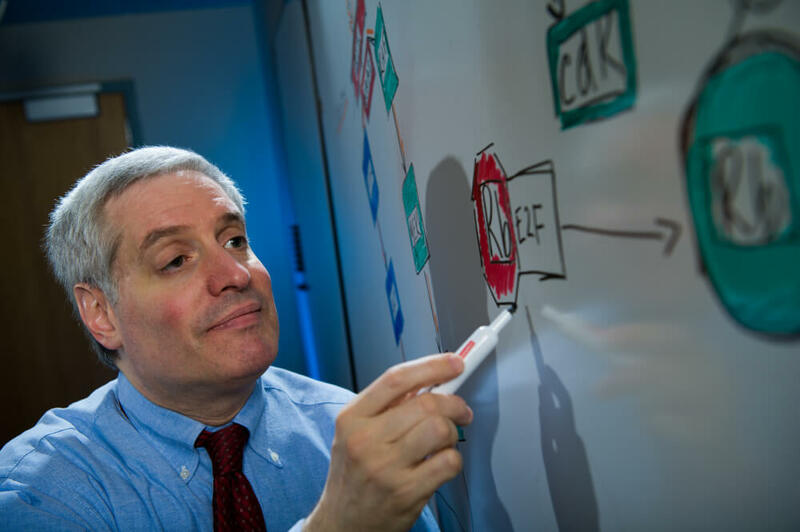 Geoffrey Shapiro, MD, PhD, is director of Dana-Farber Cancer Institute’s Early Drug Development Center (EDDC), which specializes in conducting phase I clinical trials: small, carefully designed safety studies of experimental drugs being given to patients for the first time. Here, he answers common questions about clinical trials and how they help improve cancer treatment. GS: Clinical trials are the only way to rigorously assess the safety and efficacy of new cancer drugs or drug combinations. Clinical trials are done with a great deal of care, and generate a lot of data that present the means for truly analyzing whether a drug is safe for patients, what the right dosage is, and how effective the drug is either alone, in combination, or in comparison with standard treatment. Geoffrey Shapiro, MD, PhD, director of Dana-Farber Cancer Institute’s Early Drug Development Center. What prominent advancements have come out of our clinical trials in the past year? GS: There has been tremendous progress in the development of cell cycle related agents, includ- ing CDK inhibitors, which can prevent the proliferation of cancer cells. CDK inhibitors have trans- formed the treatment of estrogen receptor-positive (ER+) breast cancer. We’re now extending these drugs to other diseases, including lung cancer, glioblastoma, and some forms of lymphoma and sarcoma. Additionally, the development of PARP inhibitors, which are lethal to some cancer cells with DNA repair deficiencies, have shown success in patients with ovarian cancer and a subset of triple negative breast cancer – and we’re extending the work to pancreatic and prostate cancer. In immuno-oncology, we are focusing on novel combinations with immune checkpoint inhibitors – drugs that unleash an immune system attack on cancer cells – in order to manipulate recalcitrant cancers into regressing and responding to these drugs. What clinical trials happening right now could signal improvements in patient outcomes? GS: We have trials directly addressing drug resistance. For example, when a cell becomes resistant to PARP inhibitors, we’re figuring out why and developing drug combinations to reverse that resistance. In addition, we’re beginning to better understand the complexity of the cells composing the tumor microenvironment that suppress the body’s immune system response, with development of novel agents to prevent or reverse that suppression. How are our clinical trials typically funded? GS: Three ways. The first involves a pharmaceutical company that sponsors the study and pays for the trial. This usually comes with full funding. The second is an investigator-initiated trial, in which we bring an idea to a drug company. They’ll provide some funding if they’re interested and we fill in with grants and philanthropy. The third way is through the National Cancer Institute (NCI). We’re one of 12 major Experimental Therapeutics Clinical Trials Network sites, which means we have a federal grant enabling us to conduct studies sponsored by the NCI. In this case, the NCI supplies the drug and oversees the study. But, as with every federal grant in this day and age, it’s underfunded – and we fill in those gaps with philanthropy, or even supplemental grants. What should people should know about clinical trials? GS: Although we do very well in enrolling patients in clinical trials at Dana-Farber, nationally, the percentage of cancer patients participating in trials is quite low. Enrolling in a clinical trial is a very important way for patients to make an impact, and the only way to move cancer treatment forward. Learn more about clinical trials from Dana-Farber Cancer Institute. Progress in many types of cancers but it seems that renal cancer is an orphan. What trials are there on this type of cancer?